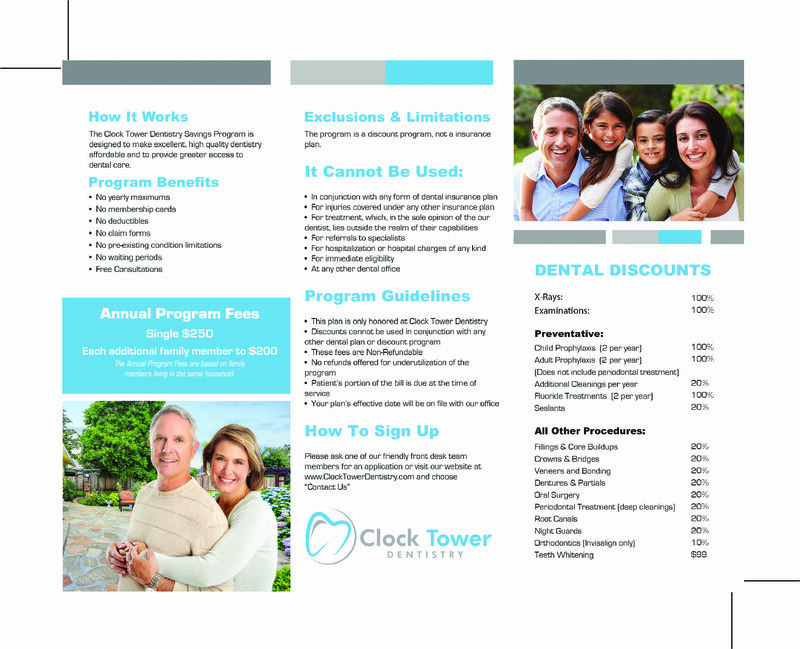 Clock Tower Dentistry accepts all major PPOs in the area. If you have questions about the specific coverage that is available, then we suggest that you contact your dental insurance provider to learn more about your plan. We offer dental insurance billing in our office to simplify the process of getting the money that is needed to pay for your services. Our office staff will help with the billing and offer information about the out-of-pocket expenses that you can expect based on your coverage. Even if you have dental insurance, most plans will require a co-pay for an exam. Some treatments are covered 100%, while other treatments are only partially covered by the insurance plan. These out-of-pocket expenses can be paid by cash, check, or credit card. Another option is to finance your treatments through a third party lender, such as the Lending Club or CareCredit. These programs often offer excellent payment terms for medical services. For example, you can finance the dental treatments without paying up-front costs, pre-payment penalties, interest costs, or annual fees. Talk to our office for more information about the financing programs that might be available for your family. We also offer an in-house Dental Savings Program, designed to make excellent, high-quality dentistry affordable and to provide greater access to dental care. Whether you have affordable dental insurance or you are paying for the treatments in a different way, we are here to help! Talk to our office team to learn more about the payment options that are available.